Note: Due to a snowstorm, we did not have Bible Class and the Divine Service this morning-Pr.Schroeder The Lord bless you in His Word! This is the beloved Son of the Father, not beloved sons, but this One, the only begotten Son of the Father. Heaven is torn open above Him so we have sight of our home, the new heavens and the new earth. The Greek word for “torn open” is the basis of our word “schism”. A ripping apart. The next time the evangelist uses this word is when the Lord dies: And Jesus uttered a loud cry and breathed his last. 38 And the curtain of the temple was torn in two, from top to bottom. Mark alone uses this word, schism for the rending of the heavens and the temple curtain. Again, the passion of our Lord did not commence publicly in Jerusalem on Good Friday, His passion for our salvation continued in earnest in the desert with Satan. Matthew and Luke tell us 3 significant temptations of Jesus but He was being tempted for 40 days and nights, the whole tempted. He was tempted in every way we are, yet without sin so that with the heavens opened, we pray and He helps us in His mercy and grace in all our need (Hebrews 4:14-16) He does battle so we can fight the good fight of faith. Mark’s narrative of the temptation is rather terse. Satan has Jesus by Himself. Satan’s strategy is simple getting people by themselves. The serpent, the snake in the grass, did this with Eve. He got her alone, or so she may have thought. Would Eve trust the Lord at His Word when she could not fully understand His Word about the tree of the knowledge of God and evil? Would Abraham trust the Lord in His Word to take his son his only Son, Isaac, “Laughter”, the child of the promise and sacrifice him on the Mountain of Moriah? Will we trust the Lord who did not spare His Son (Romans 8: 31), His only Son (John 3: 16), will He not give us all things? The heavens were ripped apart, and the Temple curtain, in Christ Jesus so we are not torn away from the Lord. The Holy Spirit cast Him into the desert. This was part of the Lord’s plan. Jesus is baptized. He goes to do battle, alone. Why? First: we can not rely on our own strength, power and spirituality to ward off the evil one, and his temptation. Jesus, in the flesh, relied on His Father. He relied on prayer. Second: we can be strengthen for our daily lives, that is our faith is made steadfast. Third: we can tell others who are also tempted by our own example and the ways in which the Lord has led us through, as He was led through those long 40 days and nights in the wilderness. Fourth: Satan wants to tempt in such a way to subtly suggest that there is no forgiveness for you from the Lord, that the Lord does not love you. This is the devil’s worse of his god damned lies. This is so we are taught His love for us even while we were sinners, Christ died for us. We are given the dignity that only God can give: He created us and when the image of God in man is cracked, He came to die for us. He did this for no angel, but you and I (Hebrews 2:16) The devil cannot fathom his Enemy’s love. Fifth: As Chrysostom preached, the devil wants to get us alone. We do not jump into temptation, but we pray, Lead us not into temptation…but when we are there, and we will be, then we pray, “…but deliver us from the evil one”. The devil is prowling lion seeking someone to devour, apart from the Church. The Evangelist Mark alone tells us that Jesus was with the wild beasts. This verse is hard to understand. It could mean a foretaste of the prophecy from Isaiah that the lion will lie down with lamb. It could mean he strove with the wild beasts. This was perilous. We all strive with the wild beasts, untamed, the Old Adam. Finding us alone and apart is still the enemy’s strategy: our selves, whole families, nations and church bodies. When alone and tempted seek the fellowship and communion of the Church, the flock of Christ’s own redeeming, steadfast together in the Word. God’s reign is our Good News, the Word going forth to do battle wresting His people from sin, death and the power of the devil. It is the Lord’s Word of the reign of God, repent and believe the Good News. This is why Jesus came out (Mark 1: ) The Gospel of God is our redemption now sealed with His blood, the new testament in His blood. We so need the Gospel of God of His grace, mercy and peace for us all in our trials. This is the very Word of God, the Sword of the Spirit. In the temptation that Jesus use His almighty power to change a rock into a loaf of bread for Himself, He kept the fast as Adam did not. The Lord, true God and true man, knew his mortality of the flesh needed more than bread, but “every Word that proceeds from the mouth of God” (St. Matthew 4 ). All of the Bible, the Word taught, preached and prayed, see the Psalms and pray them! His Word is our daily bread. as much as the body needs daily sustenance, so does the soul with the body. His Word, His Will is encapsulated in the Lord’s Word of Institution FOR YOU. For here stand the kind and precious words: This is My body, given for you. This is My blood, shed for you, for the remission of sins. These words, I have said, are not preached to wood and stone, but to me and you; else He might just as well be silent and not institute a Sacrament. Therefore consider, and put yourself into this You, that He may not speak to you in vain. We can not withstand the evil day on our own or by ourselves alone. It is not good for the man to be alone (Genesis 2). 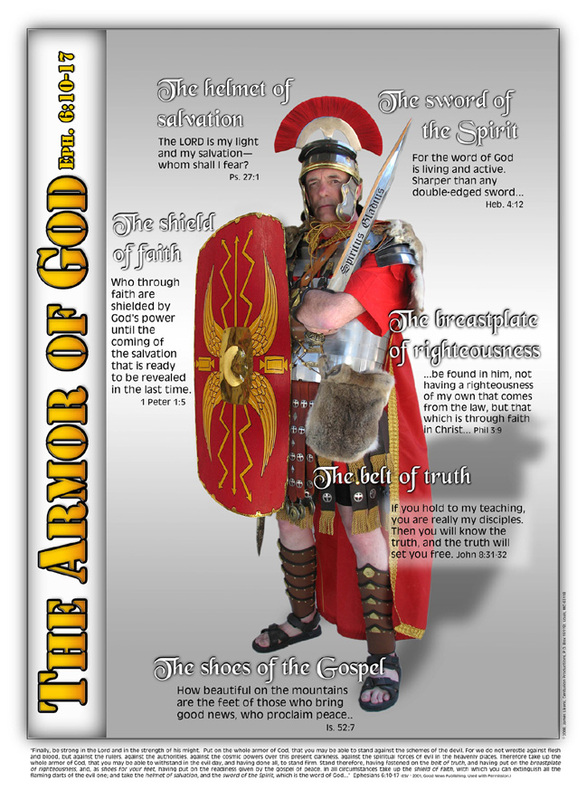 The Apostle encourages his brothers and sisters to “put on the whole armor of God”. The phrase “put on” is used some 24 times in the New Testament. The synonym is “clothe”, as in, “For as many of you as were baptized into Christ have put on Christ” (Galatians 3: 27) In Baptism you are clothed in Christ. He has fought the battle and won. He made you His own. He has drafted you into his militia, the “militia Christi”, the army of Christ. We live in the Church militant, not triumphant. 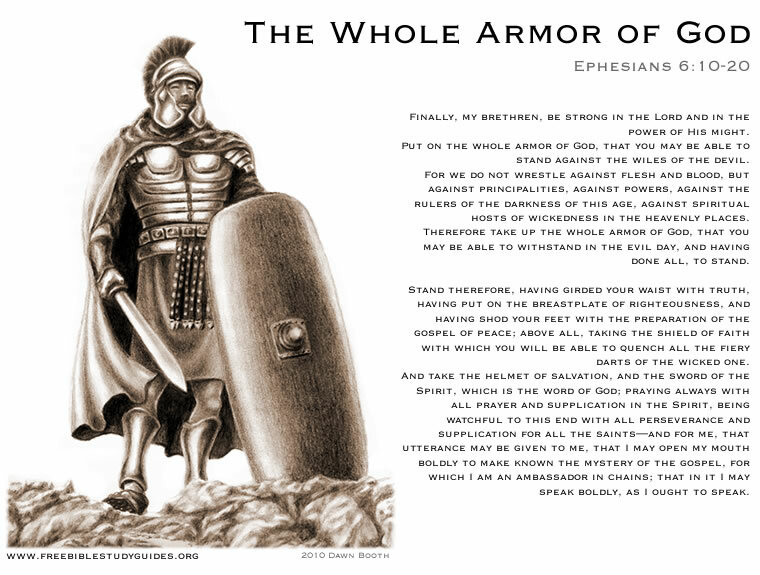 The Roman soldier’s shield protected him from head to toe. Arrows were tipped in tar and lit and then shot. The Roman soldier would dip his shield in water to douse the flaming darts. This may be a reference to Baptism through which we are washed and faith is given, so that as the Baptized, putting on the shield of faith, in order “… to extinguish all the flaming darts of the evil one.“ The evil one will shoot at you doubt and despair at your inability to withstand your own lusts of eye and heart: “Oh,you’re not a good Christian. If you really were a Christian, you would not be feeling like this.” “No, Satan! It is because I am a Christian that I know this and can cry out, I am baptized! Lord, save me!” You can not stand up against such, except by the shield of faith, the shield given to you by His grace, not by your works (! ), as He died and rose for you. (Ephesians 2 2: 1-9). The Church is assailed on many sides. Near you and beside will be a fellow Christian who in her struggles, has been there and done that and repented of it by His Law and Promise. She will bear with you in love to help you in the fight with the Shield of Faith. Our heavenly race and shunning. Then! When? After the Descent of the Holy Spirit, after the Voice speaking from above had said: This is my beloved Son, in whom I am well please (Matthew 3: 17) And since he did everything in order to teach us, and suffered everything for the same reason, so here also He willed to be led by the Spirit into the desert, to meet the devil in combat, and so that no one should be shocked if, after receiving baptism, he suffers even severer temptations: as though something strange had happened; but that he may learn to stand firm and endure with fortitude what happens according to the ordinary rule of our life. This is the reason you received arms; not to stand at ease, but to fight. And God will not prevent temptations from rushing against you. And this first that you may learn how stronger you are now than before. Then that you learn prudence; so as not to be overbold because of the greatness of the gifts you have received: for temptation will steady you. Thirdly, so that the evil demon, who is uncertain whether you have renounced him or not, may not be left in doubt, through this test of temptation, that you have abandoned him, and wholly renounced him. Fourthly, that you may become stronger, and more tempered than steel. For this reason the Evangelist speaks of Jesus as, not going, but as being led; and this was according to the design of our salvation: implying that we are not as it were to leap into temptation, but, if we are led there, to stand firm against it. And consider where it was the Spirit led Jesus. Not into a city, nor into the market place, but into the desert. For since He wished to attract the evil spirit, He gives him occasion, not alone from his hunger, but also from the place. For then especially will the devil attack us, when hem sees us alone and separated from„ each other. It was in this way he attempted the woman in the beginning: approaching as she was alone, and her husband absent. For when he sees us in the company or others, and united, he does not dare attack us. For this special reason should we ‘come frequently together’: so that it shall be more difficult for the devil to attack us.